10 FOMI volunteers went over to the island on the Friday afternoon and went through Biosecurity and H&S before setting up in accommodation for the weekend. 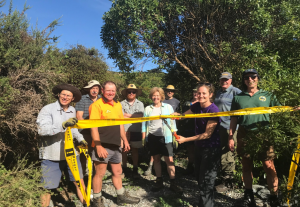 The aim for this month’s working bee was to start to construct the new wetland loop track at the beach end to link up with the one constructed last month from the Tirohanga Track. Saturday and Sunday morning everyone started early to beat the heat but the heat soon gave way to a nice cool SE breeze which was a real blessing. Thanks to Otis the DOC ranger, for cutting the trees away for the new track. This would have been huge task for the team if we had to do it by hand. It was all hands in and the trees were all dragged out to the grass area near the beach. Over the next two days we had to clear the rank grass and trees away to form the new track. Then the tidy up and stump removal started. Two culverts were installed and rocks collected from the beach to help protect the banks and any possible scouring. 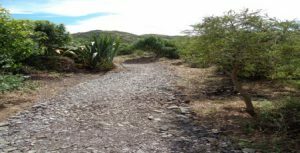 Over the weekend the island tractor did 2h 30 min carting beach gravel from the island slipway for the track surface, and rocks for the stream lining. On the Sunday we fired up the tractor chipper and all the trees that were piled out on the lawn were chipped into millions of small chips to form a nice mulch. All the metal was wheel-barrowed along the track and raked into place. The team did really well and the tracks were joined late morning on the Sunday.We had an unofficial track opening ceremony with the cutting of the ribbon by Sarah our volunteer from OMV. After the cutting of the ribbon the team walked the whole length of the track. 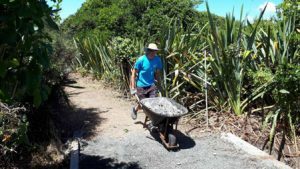 After two weekends the volunteers had hand created 166 meters of new walking track for the public to use. 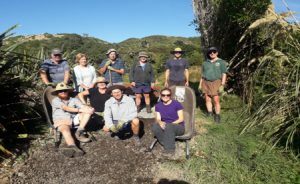 After a well-deserved cuppa tea some went up to look at the feeding of the White-Faced Storm Petrel chicks and then the last of the tidying up was completed and temporary signs installed so the day visitors could use the new track. The FOMI volunteers should be proud of their efforts as it’s looking really great. Amazing what can be achieved in two days. 189 hours of volunteer effort, completed by the whole team. Next month we will be constructing the bird hide, and building two picnic tables. But the main focus will be the House Valley pond repair. 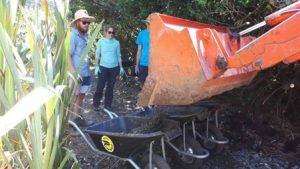 The next working bee is planned for March 22-24 which should see the wetland project largely completed. A huge thanks to our sponsors OMV for sponsoring this project. Also a big thanks to the DOC Team of Nick and Otis for doing all the chainsaw work for us. Another great partnership project between DOC, OMV and FOMI.